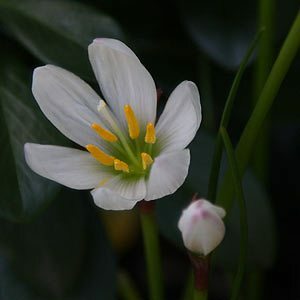 A plant with a few names Zephyranthes are often called the ‘Rain Lily’ or ‘Autumn Crocus’ they have small flowers that appear as a neat bud and open fully after a day. Reaching 15 – 20cm in height they bloom as the autumn rains begin. It is a bulb responds to rain by flowering. Zephyranthes grandiflora is a pink flowering species, while the smaller growing species Zephyranthes candida has attractive white flowers. Plant Zephyranthes in a sunny position in a well drained humus rich soil for best results. Zephyranthes Bulbs are available for sale during the winter months when they are dormant. Like most bulbs they work well when planted in groups or small clumps and can also be grown in pots or containers. Zephyranthes are best left undisturbed for best performance, larger clumps can be divided during dormancy. Protect new growth from frosts. Easy by division of clumps during dormancy. Zephyranthes can be grown from seed, be a little patient as they can take 4 – 5 years to flower from seed. Zephyranthes citrina is the yellow flowering species, difficult to find in Australia. The two most commonly available species in Australia are Z. candida and Z. grandiflora. Z. drummondii is originally from Texas and is sometimes called the ‘Prairie Lily’. Z. reginae is another yellow flowering form from Mexico. Z. atamasca is another white flowering form. Try plant fairs and garden shows for these species.